One of my goals for 2014 is to form the Run United/RunRio Trilogy Series United Medal! 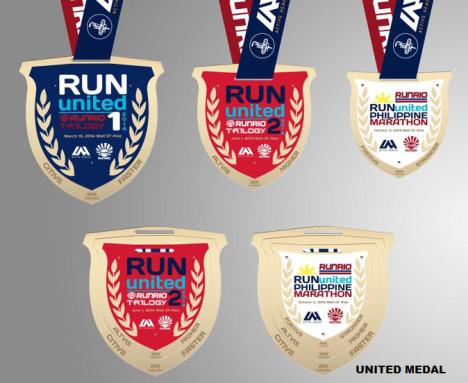 Each of the 2014 Run United Medal Series Finisher’s medal is a unique medal by itself and at the same time is a unique part of a 3-piece united medal from the Run United Series legs. 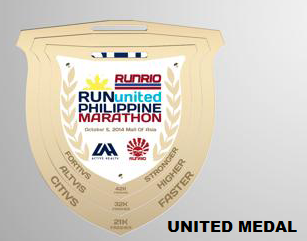 Register and finish the 21km/21km/21km or 21km/32km/42km of legs 1/2/3 respectively and form the united medal which is the 2014 unique Run United/RunRio Trilogy Series United Medal! If a runner finishes all three legs in the category 21km/ 21km/ 21km or 21km/ 32km/ 42km, he/she will be able to form this united medal.